Peter and the others were asleep. But they woke up and saw the glory of Jesus. They also saw the two men that were standing with Jesus. When Moses and Elijah were leaving, Peter said, "Master, it is good that we are here. We will put three tents here—one for you, one for Moses, and one for Elijah." (Peter did not know what he was saying.) While Peter was saying these things, a cloud came all around them. Peter, James, and John became afraid when the cloud covered them. I can identify with Peter, can't you? He wakes up and sees a once-in-a-lifetime event and does not know what to do or say. 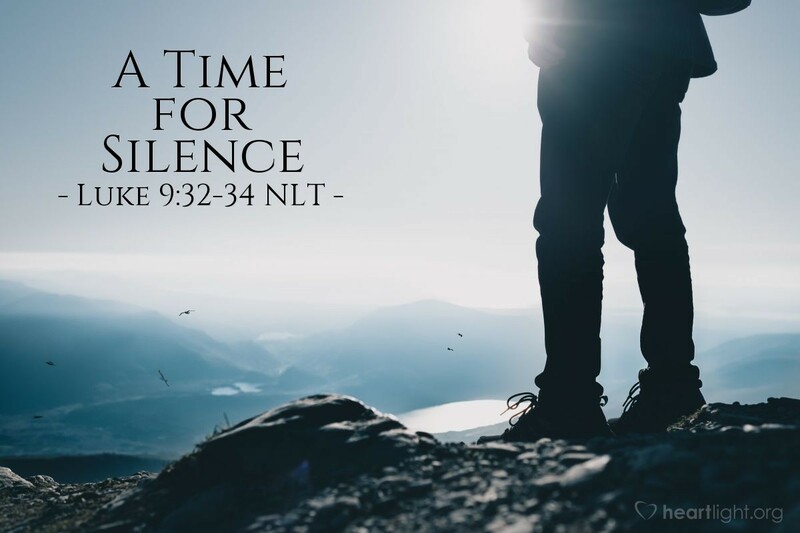 Humility and awe would suggest that he remain silent and take his cue from Jesus. Instead, Peter talks when it is really a time of silence. However, his impertinent and shallow comments are put in their place as the event humbles him into silent terror. Reverence, awe, and listening are the proper responses to a glorious glimpse of Jesus in all of his glory! O gracious heavenly Father, please forgive my compulsion to speak when I should be reverently silent. Humble me gently and help me see my proper response in the presence of your glorious Son with whom there is no equal, rival, or comparison. In Jesus' name I pray. Amen.